Click 'Learn More' and add your details and we will contact you with more information on this investment opportunity. We will then provide you with a unique login, so you can log back in again anytime. Ternio, LLC has built a proprietary, scalable blockchain architecture called Lexicon (patent-pending) for use in a permissioned, decentralized environment. Ternio’s platform aspires to bring accountability and transparency to any supply chain through an encrypted, immutable protocol that can utilize different blockchains based on its specific needs. Any application, infrastructure, company, or industry may be able to potentially utilize Lexicon’s scalable blockchain architecture to handle the needs of B2B, enterprise solutions. The company’s first vertical is the programmatic digital advertising industry that requires very high transaction speeds and scalability. Ternio may be the first company within programmatic digital advertising to use blockchain on an impression level basis. The company’s planned products and services include Lexicon Blockchain, Blockchain Xcelerator, Block CardTM, and factoring services. The Request: Ternio is seeking equity of up to $10 million to further develop and market their products, working capital and hiring additional staff to grow sales. Lexicon blockchain is an enterprise solution well suited for industries such as healthcare, government, digital advertising, messaging applications, and others. For the digital advertising vertical, according to the company, Lexicon is a permissioned based blockchain architecture utilizing a ledger system for record keeping of the contracts between publishers, advertisers and the rest of the supply chain. Ternio is slated to provide Blockchain as a service (BAAS) to other enterprises that want to speed up their blockchain including Ethereum without having to convert to the Lexicon blockchain. Blockchain Xcelerator would allow any user, in any industry to use their services. The Block Card is a planned prepaid cryptocard that is intended to allow cardholders to use their cryptocurrencies anywhere VISA is accepted to spend Bitcoin and Ethereum on their regular purchases at the store, movies or traveling. Block Card may allow for users to spend their cryptocurrencies faster and with fewer fees than cryptocurrency exchanges. Within the digital advertising vertical, instead of transferring funds to a publisher’s digital wallet, bank account, PayPal, or other mechanism, the Block Card planned to allow for near-instantaneous transfers, giving publishers direct access to funds they earned the previous day. Still pending final bank approval. Ternio plans to use blockchain to verify transaction information to finance payments. For the first use case in the programmatic digital advertising industry, payment terms will be shortened from 60 to 90 days to NetZero. Ternio plans to work with a third party to charge publishers a percentage to finance their pay-outs. The target market for Ternio’s blockchain covers industries including fintech, social media applications, healthcare, government services or any other industry that requires a scalable blockchain. The Company’s first use case is in the digital advertising industry. Currently, there exist no blockchain solutions capable of handling the level of transactions needed within the digital programmatic space. Ternio will use Lexicon to disrupt many industries, starting with the $270+ billion per year programmatic digital advertising market. 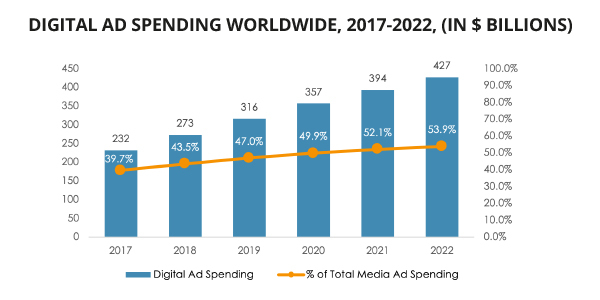 According to the eMarketer, the total worldwide digital ad spending in 2018 is projected to be approximately $270 billion.¹ This figure could increase by more than 65% to US$394 billion in four years' time. Approximately 77%² of the digital ad spend is estimated to be done programmatically, of which 58% is consumed by intermediaries. Programmatic advertising refers to the real-time buying of ads targeting their audience online. The buyer often pays for impressions, or how many eyes the advertising is delivered. Like the larger advertising and marketing ecosystem, programmatic advertising has two key problems: fraud and waste. Fraud is a significant problem within the digital advertising industry with an estimated $16 billion in fraud in 2017 and a projected $19 billion in 20184. Ternio plans to solve the problems that plague digital advertising such as lack of transparency, lengthy payment models and advertising fraud. Ternio intends to provide the Lexicon blockchain to existing companies in the marketing and advertising supply chain who already control billions in ad spend rather than compete with them by building an ad network. Ternio plans to enable the company to verify users, instantly pay publishers, and protect advertisers from ad fraud. Ternio platform has a B2B, SaaS business model focused on enterprise solutions that require tremendous scalability. The digital advertising industry faces many challenges: ad fraud, lack of transparency, and lengthy payment models. It is a complex and ever evolving environment for advertisers and publishers alike to navigate. Ternio was born out of necessity to streamline and bring clarification to both sides of the table. Ternio intends to provide a verifiable and decentralized architecture that empowers advertisers to verify spend through each intermediary and gives publishers the assurance and guarantee of being paid on delivery. Ternio plans on providing blockchain solutions to existing and trustworthy ad companies in the supply chain- enabling those companies to verify users, instantly pay publishers, and protect advertisers from ad fraud. Today’s programmatic advertising market is made up of a series of layers which a brand’s ad campaign will travel through before reaching the publisher’s website and ultimately the user. Each layer takes a portion of the revenue before moving on to the next layer and sometimes these layers provide limited or no value to the brand’s ad campaign. Ternio intends to complement the existing supply chain by bringing full transparency into the costs associated with each layer. Ternio may enable the brand, publisher, and all layers within the supply chain to understand the value being provided. Through complete transparency of the Lexicon blockchain, if the supply chain decides that a certain layer is not providing value, then the supply chain reforms to the path of least resistance and greater efficiency. The Ternio framework is a combination of Lexicon Blockchain, Ternio Blockchain and a communication layer for fast data transfer. The Ternio’s platform may facilitate instant transactions between advertisers and publishers, as well as connect publishers, advertisers and service providers The advertisers will get verified traffic and reduce expenditures. The Ternio system plans to have a fraud-protection mechanism to ensure user and domain verification. A - Lexicon relies on decentralized nodes to process transactions. These permissioned nodes sign, verify, and hold contracts that only those within a particular supply chain will have access to. for transaction settlement processing. B - The Communication Layer is the first access point onto the Ternio network and facilitates almost all of the interaction between the website, the advertiser, and the contract. This layer allows for ultra-fast multidirectional communication between Ternio, the publisher, the advertiser, and the platform’s fraud detection mechanism. C - Tokenization Through the use of tokenization – advertisers or ad agencies may be able to pay all participants within their supply chain directly through asynchronous payments in a way that is presently not capable. 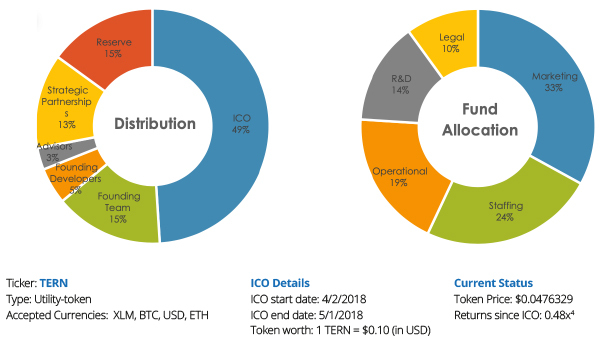 Advertisers or agencies will be able to use their own tokens and they’ll pay for the benefit of using Ternio’s architecture. This will prove to be a significant value to the industry as Ternio has already spoken to the world’s largest ad agencies about it. • Complementary Platform: The platform works within existing operational frameworks with the goal that companies may save well on undesirable overhead costs and expenditures. • Track-back system: Ternio employs a ‘track-back system’ which assists in combining data from multiple blockchain layers into a solitary impression agreement while ensuring only permissioned parties can access privileged information. • Flexibility: The blockchain possesses the flexibility to run within both permissioned as well as open environments while maintaining a completely decentralized state. • Scale: In a recent testnet, the platform was able to deliver over 1 million transactions per second. This scale is required to support high QPS (queries per second) of programmatic buying and selling (similar to high frequency trading on the stock market). Ternio tokens are abbreviated under the symbol TERN. They’re used as the primary method of exchange with its BlockCard product and in use with the Lexicon blockchain. They are currently trading actively on StellarTerm, BitForex, Exrates and StellarPortcryptocurrency exchanges. The Company will maintain a sizeable portion of tokens which it can sell on exchanges at its own discretion and/or use the tokens for strategic partnerships. The digital advertising industry is projected to be $270+ billion in 2018. Ternio has a first-mover advantage with its scalable blockchain that can handle the transaction speeds necessary for the digital advertising industry. Separate from the BaaS model – there’s a $270 billion crypto market that has $7 billion in trading volume a day which the company is seeking to capitalize on. The BlockCard (trademarked) will allow for users to spend their Bitcoin and Ethereum on their regular purchases at the store, movies or traveling. After making inroads in the digital advertising system – Ternio expects to expand its patent-pending Lexicon blockchain into other areas like fintech, social media apps, healthcare and government services. The core team behind this project consists of personnel who have been in the digital/financial domains for nearly a decade each. Daniel Gouldman is the co-founder of Ternio. Mr. Gouldman has co-founded and managed several successful multimillion-dollar digital companies over the past several years ranging from media to ad tech to digital advertising. Mr. Gouldman has assisted in the digital efforts of the ACLU, political and non-political organizations. Prior to that, Mr. Gouldman was a Vice President for a $40 billion company and has been directly responsible for revenues from $50 million to $75 million at various companies. Ian Kane is the co-founder and blockchain programmer for Ternio. Mr. Kane is has worked in digital media for over 10 years with a heavy focus on business development, sales and strategy. Mr. Kane’s career started as the 1st employee in a media startup which grew into a $50 mm a year business during his tenure. Mr. Kane was the Chief Revenue Officer at Ad3 Media and prior to that, he was head of Publisher Solutions at Tapad which was acquired by Telenor for $360mm. Bryant Maroney is the Chief Technology Officer of Ternio. Mr. Maroney specializes in cryptography and blockchain development with over 18 years of enterprise experience and the ability to program in over a dozen languages. Prior to his work at Ternio, Mr. Maroney was the CTO at Ad3 Media, the owner and Senior Engineer at Coded Design LLC, and the Senior Application Engineer at Beanstalk Data. Prior to Ad3 Media, Mr. Maroney was the Architect of Emerging Technologies at Bank of America. • Acquisition Target: Their technology will be particularly of interest to multi-national firms like IBM, Microsoft, Oracle, Amazon, Google, Facebook and other large ad agencies/tech companies, which makes them good acquisition target. • IPO: The company views an IPO as a realistic exit strategy down the road. There is always a risk that the SEC could take action related to the cryptocurrency associated with Ternio. Ternio has filed a Reg D exemption with the SEC. The Issuer’s direct and/or indirect investments in the Company will be inherently risky due to the nature and business of the Company. •	The digital asset market is developing and under-regulated and subject to enforcement by regulatory authorities. The laws and regulations are lagging behind innovation and as such it is not possible to predict the legal risk beforehand. •	Risk of weaknesses or exploitable breakthroughs in cryptography, such as development of quantum computers. •	Internet transmission risks, such as failure of hardware, internet connections or software all of which would delay the recorded date and time of the transaction onto the ledger. Blockchain and cryptocurrency transactions are not necessarily validated by when the transaction was initiated but rather by when the transaction was recorded. •	Confidence in the market for digital assets or Lexicon may be lost as it involves a high degree of uncertainty. •	Taxation of digital currencies and transactions in the US and internationally may affect the platform’s success. •	If a weakness is exploited in the underlying code, smart contract or any other blockchain related operations, the legal liability becomes unclear as well as the ability to mitigate the loss. •	The Company has not proven the profit potential of the business model, and even if the Company meets its revenue expectations, there is no guarantee that the Company will be profitable or that costs will not continue to exceed revenue. The Company has experienced negative cash flow from operations in the past and may do so again in the future. If the Company’s capital resources are insufficient to satisfy its liquidity requirements and overall business objectives, it may seek to sell additional equity securities or obtain debt financing. •	The difficulties Company faces in managing rapid growth in personnel and operations. Pricing pressure could adversely impact Company’s planned pricing structure and have an adverse effect on Issuer’s results of operations. •	The rapidly changing technological, social, economic and regulatory developments that requires a wide-ranging set of expertise and intellectual capital. •	For the Company to successfully compete and grow, it must retain, recruit and develop the necessary personnel who can provide the needed expertise across the entire spectrum of its intellectual capital needs. •	An interruption in or breach of the Company’s information systems may result in lost business. •	Interruption or termination of service from third-party related vendor core to company’s product. •	The Company relies on 3rd party for product development, management, and planning, which may impact the Company’s ability to execute on its product development plan. •	The Company may face intense competition that could adversely impact its market share and its revenues. •	Competitors may be much larger than the Company, have better name and/or brand recognition than the Company, and have far greater financial and other resources. •	The intense competition in the computer hardware industry has also led to rapid technological developments, evolving industry standards and frequent releases of new products and enhancements. The Company’s inability to adapt to technological changes in the industry could significantly harm its business, financial condition, liquidity and results of operations. •	The Company’s products and services will be subject to the changing technology and failure to improve, introduce, or otherwise perform new technology will negatively impact market acceptance of its products and services. •	Future results will depend on the Company’s ability to provide products and services that compare favorably on the basis of appearance, performance, market acceptance, market dynamic and cost with the products and services of its competitors. •	The Company will be dependent on the software and technology industries. •	The Company will be exposed to the regulatory environment. •	The Company’s customer subscription level may not be an indication of engagement or company success. •	The Company’s reliance on contracted team members may lead to potential for high turnover, impacting knowledge base continuity and stability. •	The competition the Company experience from other companies ranges in size from large, diversified providers to small, highly specialized providers. •	The Company is dependent on market acceptance of new technology introductions and innovations for revenue growth. •	The Management will have broad discretion in the application of Distributable Cash. •	The Company is permitted to utilize funds above minimum $1,000,000 raised in the Offering prior to the entire amount of the Offering being completed. •	The Company’s management shall have wide discretion as to the exact priority and timing of the allocation of funds raised from this Offering. •	The Company’s Management may invest the proceeds from this Offering in ways in which not all the Shareholders, and/or members of the Issuer may agree. •	The estimates and projections contained in this Memorandum may not be realized. •	No assurance can be given that the potential benefits described in this Memorandum will be achieved. •	You will have little (no) control over operations of both Company and Issuer. •	You will have limited (no) voting rights and will have no control over the Company or Issuer management and must rely almost exclusively on the management. •	There will not initially be a market for your Units in the Issuer and Issuer’s shares in the Company, and there will be restrictions placed on transfer of either. •	If a public market for the Company’s shares of common stock and preferred stock does not develop, your stock will be illiquid and you may lose all or a portion of your investment. •	There may be restrictions placed on the transfer of the Membership Units purchased in this Offering. •	There may not be sufficient funds to make cash distributions to Shareholders. •	The Company is required to indemnify its officers and directors for good faith actions and the indemnification obligation may cause any liability it incurs to be paid by the Issuer. •	The Company has a pricing model that has not been completely tested yet. •	The Company will engage in employment agreements and there is no guarantee that that the company will generate enough revenue to offset these operating expenses. •	The Company’s business may be negatively affected if the Company is unable to protect effectively its intellectual property. •	Company will be exposed to general market and economic fluctuations which may impact the demand for its product. •	Company has a security lien on the following assets: present and future accounts, receivables, chattel paper, deposit accounts, personal property, assets and fixtures, general intangibles, instruments, equipment and inventory. •	GAAP Accounting procedures not implemented. All financial statements completed by the Company. If, for any of these or other reasons, the Company is unable to effect its plans or to generate sufficient cash flow to meet principal or interest payments on its indebtedness or to meet other obligations when due, the value of the Issuer’s investment in Company securities could be significantly reduced or eliminated. This presentation does not constitute an offer to sell or a solicitation of an offer to buy any security and may not be relied upon in connection with the purchase or sale of any security. Any offer would only be made by means of a formal offering memorandum. No offer or solicitation will be made prior to delivery of a confidential information memorandum, private placement memorandum, or similar offering documents (“Offering Documents”). Offer and sales will be made only in accordance with applicable security laws and pursuant to the Offering Documents, operating agreement, subscription agreement, and other definitive documentation. This presentation does not purport to be all-inclusive or to contain all of the information that the Recipient may require and is qualified in its entirety by reference to the Offering Documents. This presentation is not a part of or supplemental to the Offering Documents or such definitive documentation. The Offering Documents and any supplements will supersede this Presentation in its entirety. Projections and other forward-looking information as to events that may occur in the future (including projections of revenue, expense, net income and stock performance) are based on information provided by the Issuer and other publicly available information as of the date of this presentation. There is no guarantee that any of these estimates or projections will be achieved. The Recipient should not rely on any information contained herein. No investment, divestment or other financial decisions or actions should be based solely on the information in this presentation. Actual results will vary from the projections and such variations may be material, including the possibility that an investor may lose some or all or its invested capital. This presentation is confidential. By acceptance hereof, you agree that (i) the information must not be used, reproduced, distributed to others without the prior written consent; (ii) you will maintain the confidentiality of this information, not already in the public domain; and (iii) you will on use the information contained herein for informational purposes. Headquartered in San Francisco, US Capital Global Securities has a presence in several cities across the United States. To meet increased demand for business financing, the firm recently doubled its office space in the heart of San Francisco’s Financial District. Click the button and add your details and we will contact you with more information on this investment opportunity. We will then provide you with a unique login, so you can log back in again anytime. Securities offered through US Capital Global Securities, LLC, member FINRA, SIPC.